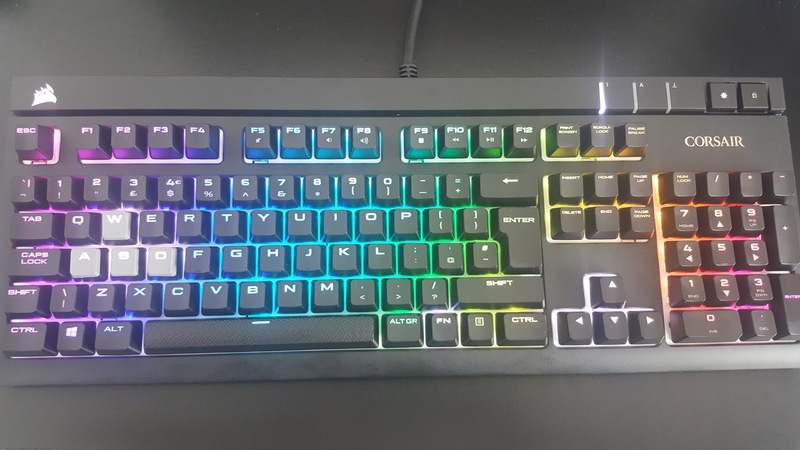 If you're after a mechanical keyboard that isn't overly expensive, has some good features and not insanely loud, the Corsair STRAFE RGB Mechanical Keyboard with Cherry MX Silent Switches is a damn good bit of kit. Unlike my last mechanical keyboard, the Roccat Ryos MK Pro, the Corsair has a removable rest at the bottom which I never use, so thankfully it takes up a lot less space. Given all the features it has, it takes up so little space on my desk I'm really quite surprised by it. It measures only 450mm x 170mm x 40mm so it's really not big at all. It's actually cheaper than my previous Roccat keyboard too, so that's a bit of a bonus. The Corsair also comes with edged/patterned WASD keys (which I decided to use), with W/A/D having a slight ramp on the side to stop you slipping off them—surprisingly useful for FPS games. It has similar keys you can use for a few other keys as well. The keys were really easy to change around with the look hook it gives you, which was really great as I don't like small fiddly things. It's nowhere near as loud as a lot of keyboards, although saying it's silent would be pushing it pretty far. It's quiet, sure, but still audible enough so that you're still aware you're typing. Absolute silence would be a little bit weird, but it's a much duller sound that isn't irritating which makes it great to use for long periods. I actually cranked up the gain on my microphone for that test too, so it's quite impressive. For those of you who like to play your games in a dark room, but don't want to be blinded by your keyboard, the Corsair also features multiple brightness settings at the touch a button (including off). The ckb-next project is not an official Corsair product, but another great example of how open source is great. I've not had a single issue with ckb-next personally, messing around with profiles, animations and so on is an absolutely breeze. It's been a fantastic experience with it so far. If you're looking for a decent mechanical keyboard or even your first ever, this is absolutely one that needs some serious consideration. I don't have a single issue with it, which is a rare occasion when it comes to hardware as I usually end up nit-picking at various things, but I don't have a bad thing to say about it. Find it on the Corsair site or your favourite retailer. Looks nice. My ryos MK pro looks too "gamerish" and is quite big, but i freaking love the macro buttons. Couldn't live without those buttons anymore, so its hard to find a good keyboard that doesnt look like Gamer crap with macro keys. 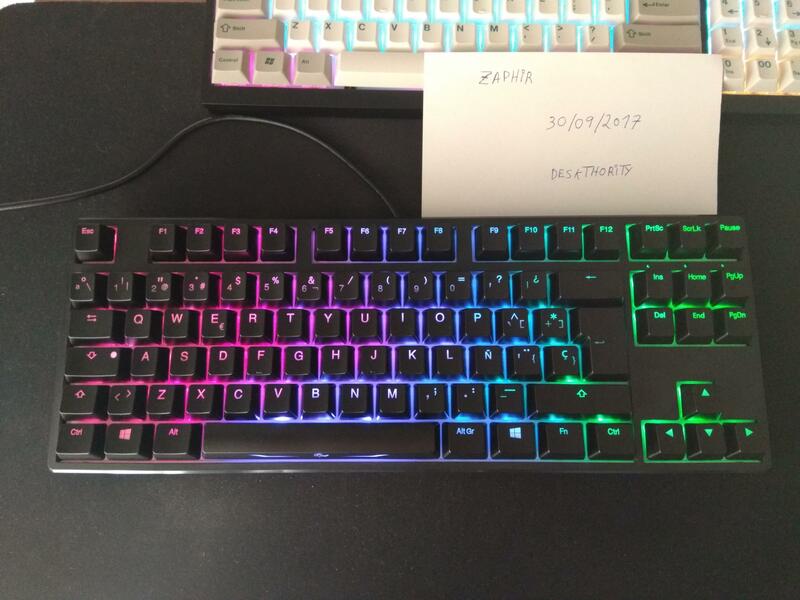 Just bought a Ducky One TLK RGB with Chery MX Brown. I hear they're popular in South Korea for gaming. I'm also looking for a second one. 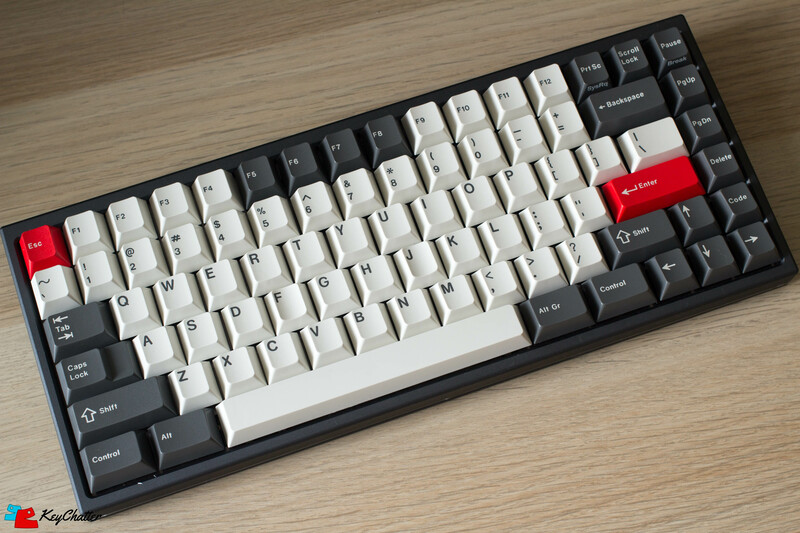 Here's a video of the KBD75 build process if you want to order it unassembled. As for the Corsair STRAFE I would definitely say if you want to buy local and be able to demo or return it then it's a good pick. When selecting other keyboards, keep in mind that some keyboards have volume buttons or rollers above the numpad and they are at a lower height than the keys below them -- so it will feel weird on keyboard versions with the volume rocker and or keys at a lower height. That's pretty cool someone made a Corsair app, at least for Ducky it's cool that the color changer for all the keys and modes is built into the keyboard and function key changeable. So hopefully when it comes in it'll be a riot of fun. Nice! I have a Roccat Ryos MK Pro at work and the Fx version at home. Guess now I know which keyboard I will switch to at work at least if one of them dies on me. I swear some people just want the loud keys for feedback, for me it is the fact that I don't have to deal with mushy keys. I used to get bad carpal tunnel, then I switched to an ergonomic keyboard. That fixed the wrists but then caused pain in my fingers, getting a flat mechanical keyboard has helped me with that, and now that I am so used to typing with my wrists upward that the ergonomic keyboards force you to do, I do the same on the flat ones. 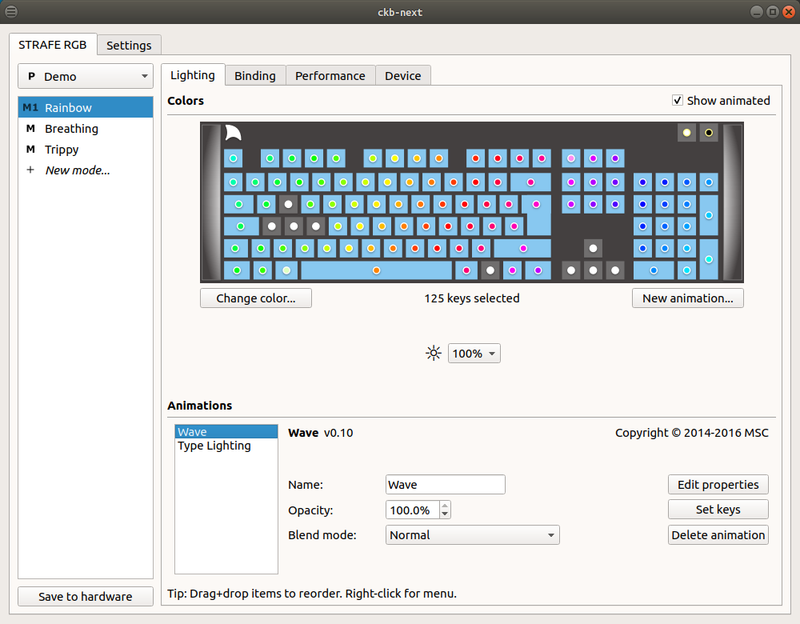 And if you couldn't get the keys changed on the keyboard level then you could write a new keyboard symbol in Linux -- I did this once because the Caps lock annoyed me. I turned it into a SUPER key on the low-level to reduce finger strain when doing weird key combinations. Yeah, swapping Caps Lock and Control is easy. But placing Escape in the second from the top row and Backspace in the third from the top is already hard. Especially Backspace, since it has a different shape. I'm severely allergic to this backlight nonsense, but I could go for a decent (non-rgb) Ducky with silent switches if they weren't so damn expensive. Shmerl Yeah, swapping Caps Lock and Control is easy. But placing Escape in the second from the top row and Backspace in the third from the top is already hard. Especially Backspace, since it has a different shape. The HHKBs do exactly that but are expensive.